Boil noodles according to box instructions. Drain well. 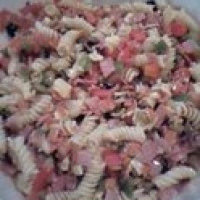 Chop tomato, onion, pepper, olives, salami, capacola, pepperoni, provolone and cheddar into bite sized pieces and put into the bowl. Add oil, vinegar, sugar and oregano into a blender and mix well. Pour over all ingredients and toss gently. Enjoy the amazing blend of colors, smells and best of all, flavors! This sounds delicious! Saving it to try out! Mmmm sounds yummy! Thanks for sharing! Thank-you for the recipe,a nice cold salad to go will on a day like today. Like madmommy's recipes? Never miss an upload!